"The more complicated and scattered his thoughts, the more unmanageable his task. His distractions will force him to think big, rather than think small. His focus on whatever task he must execute will not be intense. This one small deficit becomes the athlete's biggest inhibitor to performing effectively." "Your thought process must be simplified and concerned only with what is happening now to win or reach your peak performance in sports." "It is highly beneficial for athletes to know what to think as they are preparing for competition." 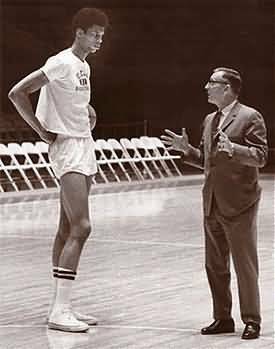 I can't tell you how many times I have heard a coach tell a basketball player that he is thinking too much, or that he should stop thinking and just play. And, then within minutes, tell the same player to get his head back in the game. Is it any wonder that there are players who are confused and don't know what to think. And by not knowing what to think, these players will feel more internal stress, begin questioning themselves and start struggling on the court. First, one of the smartest things you can do as a coach is not to tell your players to stop thinking. Second, tell the players that it is normal for any person, who has a pulse and is breathing on his own, to be thinking. And third, tell them that you will teach them how to think so they can become mentally stronger and smarter basketball players. I would begin by asking your players what they are thinking about when they are on the court and playing in a game. Don't rush them. Give them a moment to think about your question. Encourage them to explore where their heads are at when they step onto the court. It's important that they can recognize and acknowledge all the different thoughts and feelings that they are dealing with and experiencing. And this is your way of letting your players know that you know and understand how important their thoughts and feelings are to how they play and perform. After they begin to open up, you can then talk to the players about the challenges of knowing what to think or how to think on the court. They need to realize that a lot is coming at them - mentally, emotionally and physically - and therefore, they need some kind of structure or process to channel their thinking so they can stay focused, maintain their poise and play with confidence. Without knowing how to organize and manage their thoughts, your players will find themselves following apart - mentally and emotionally. One way of showing your players how to better control their thinking, and thereby mentally manage their game, is by talking to them about "streamlining". This is where you teach them how to narrow their focus on a short and simple line of thinking when they are on the court. And by getting them to streamline, they will learn how to play in the present moment, tune out distractions, keep negative feelings at a minimum, and make quicker and smarter decisions. The first verbal cue in streamlining is "now" or "check". Your players must recognize that they have to keep their attention and focus on the present moment, know what is happening right in front of them and continuously "check in mentally" to keep themselves in the game . The second verbal cue is "eyes" or "see it". The players need to understand that they have to clearly see what is happening in the game if they want to make the right decisions and moves on the court. The third verbal cue is "good" or "it's ok". This cue is to simply trigger a mental message to the players that no matter what is happening in the moment they have everything under control, and it will all be ok. And the fourth verbal cue is "make" or "take it". The players are now reminding themselves to make their move on the court, or take that game-time situation and turn it to your advantage. So, one streamline for your players is - "now - see - good - make". Another streamline is "check - eyes - good - pop". The "pop" stands for "play on purpose", and reminds you to focus on your goal or what you want to do. You want your players to keep their streamlining to no more than four words. You're giving the players a mental frame of reference or structure that keeps their minds in the present moment, on the task at hand, and with a sense of assurance that they will be able to adjust and succeed. When your players learn how to streamline, they will play with greater concentration, composure and confidence.